Fourteen radio galaxy predictions ClaRAN made during its scan of radio and infrared data. All predictions were made with a high ‘confidence’ level, shown as the number above the detection box. A confidence of 1.00 indicates ClaRAN is extremely confident both that the source detected is a radio galaxy jet system and that it has classified it correctly. Credit: Dr Chen Wu and Dr Ivy Wong, ICRAR/UWA. The result is an AI bot named ClaRAN that scans images taken by radio telescopes. Its job is to spot radio galaxies—galaxies that emit powerful radio jets from supermassive black holes at their centres. ClaRAN is the brainchild of big data specialist Dr Chen Wu and astronomer Dr Ivy Wong, both from The University of Western Australia node of the International Centre for Radio Astronomy Research (ICRAR). Dr Wong said black holes are found at the centre of most, if not all, galaxies. “These supermassive black holes occasionally burp out jets that can be seen with a radio telescope,” she said. “Over time, the jets can stretch a long way from their host galaxies, making it difficult for traditional computer programs to figure out where the galaxy is. Dr Wu said ClaRAN grew out of an open source version of Microsoft and Facebook’s object detection software. He said the program was completely overhauled and trained to recognise galaxies instead of people. ClaRAN itself is also open source and publicly available on GitHub. Dr Wong said the upcoming EMU survey using the WA-based Australian Square Kilometre Array Pathfinder (ASKAP) telescope is expected to observe up to 70 million galaxies across the history of the Universe. By combining the data from different telescopes, ClaRAN’s ‘confidence’ level in its detections and classifications is increased. Shown as the number above the detection box, a confidence of 1.00 indicates ClaRAN is extremely confident that the source detected is a radio galaxy jet system and that is has classified it correctly. To the left is a radio galaxy jet system detected by ClaRAN using only data from radio telescopes. ClaRAN isn’t sure what it’s seeing here, giving two predictions, one covering the entire system with a low confidence of 0.53, and one covering the top jet only with a confidence of 0.67. To the right is the same galaxy, but with infrared telescope data overlaid. With the inclusion of data from infrared telescopes ClaRAN’s confidence in the detection has increased to the highest value of 1.0, and ClaRAN now includes the entire system in its only prediction. Credit: Dr Chen Wu and Dr Ivy Wong, ICRAR/UWA. She said traditional computer algorithms are able to correctly identify 90 per cent of the sources. “That still leaves 10 per cent, or seven million ‘difficult’ galaxies that have to be eyeballed by a human due to the complexity of their extended structures,” Dr Wong said. Dr Wong has previously harnessed the power of citizen science to spot galaxies through the Radio Galaxy Zoo project. “If ClaRAN reduces the number of sources that require visual classification down to one per cent, this means more time for our citizen scientists to spend looking at new types of galaxies,” she said. 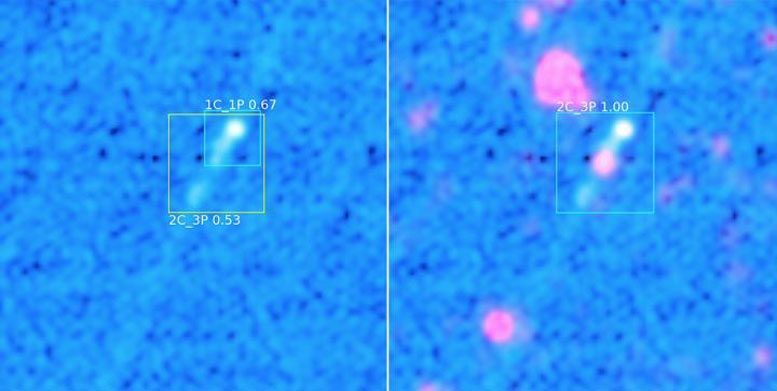 A highly-accurate catalogue produced by Radio Galaxy Zoo volunteers was used to train ClaRAN how to spot where the jets originate. Dr Wu said ClaRAN is an example of a new paradigm called ‘programming 2.0’. “All you do is set up a huge neural network, give it a ton of data, and let it figure out how to adjust its internal connections in order to generate the expected outcome,” he said. “The new generation of programmers spend 99 per cent of their time crafting the best quality data sets and then train the AI algorithms to optimise the rest. Dr Wong said ClaRAN has huge implications for how telescope observations are processed. “If we can start implementing these more advanced methods for our next generation surveys, we can maximise the science from them,” she said. A research paper on ClaRAN was released today in Monthly Notices of the Royal Astronomical Society, published by Oxford University Press.